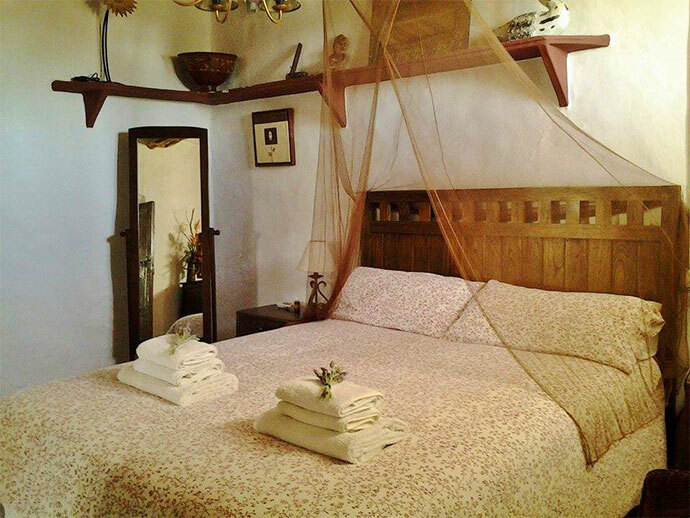 Casa Shakti is a 17th century finca (Spanish for farm), nestled in pine covered hills behind the town of San Carles de Peralta, surrounded by nature and the scent lavender and rosemary. 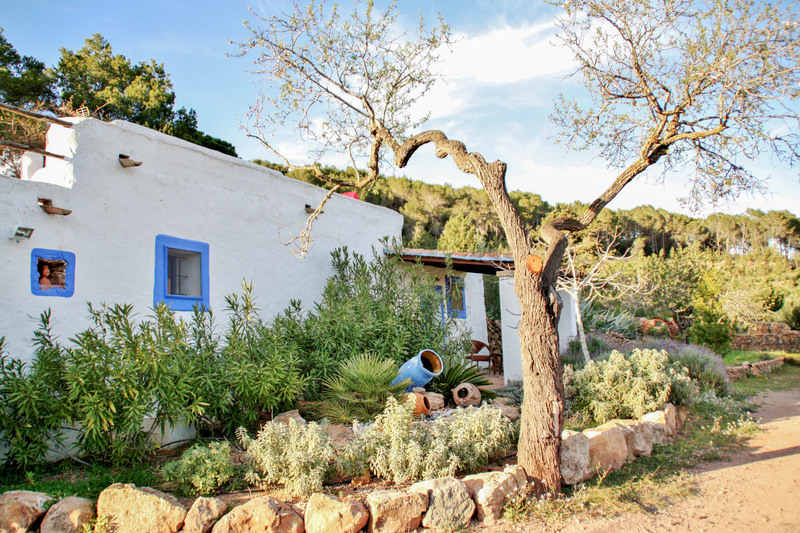 The house sits in an idyllic spot, on a hilltop with wonderful sweeping views over the valley and out to sea and to the island of Formentera. The land extends over 50.000sqm and is covered partly by forest, which offers shade and respite from the heat of the summer, and partly by a large expanse of almond trees, which blossom spectacularly in spring. Large century-old terraces are devoted to organic cultivation and to housing our 4 lovely rescue horses Arachana, Apache, Beauty and Indigo. 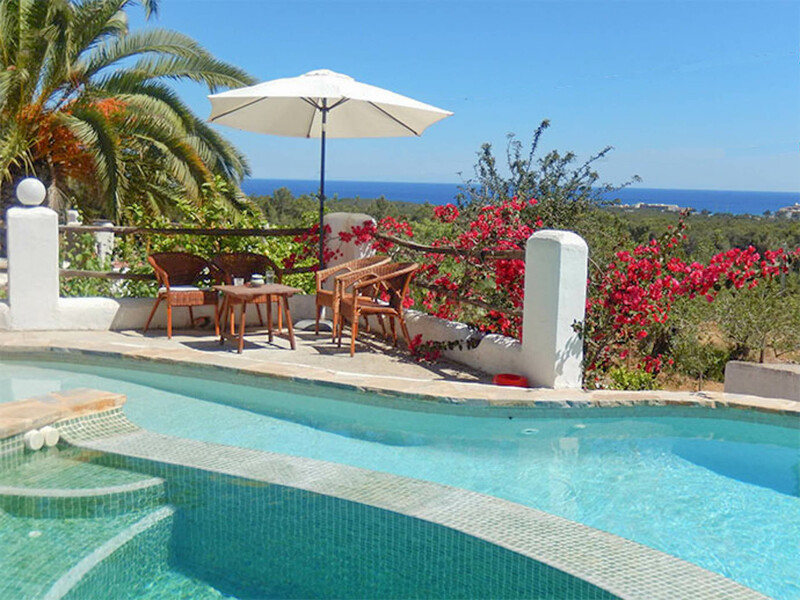 The finca has several terraces for relaxing and enjoying the views and a lovely cobbled courtyard that leads up to our gorgeous swimming pool, with jacuzzi and spectacular views. 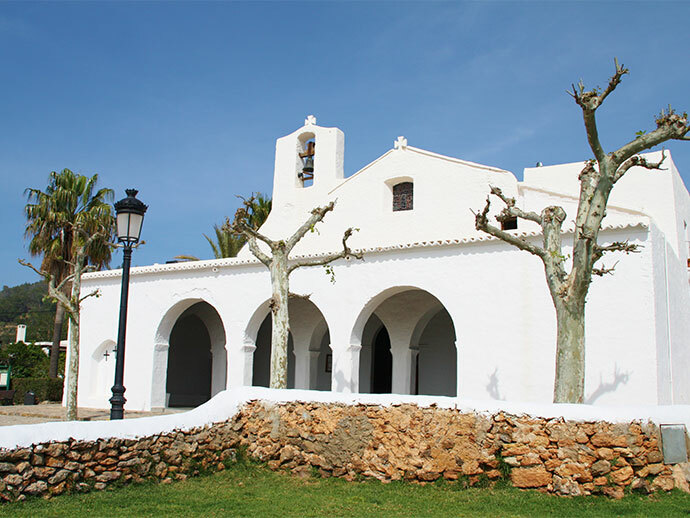 The villa’s secluded surroundings offer absolute peace and tranquillity whist being only a 2 minute drive from San Carles village, renowned for its lively atmosphere and variety of bars and restaurant. Its biggest draw however is the famous long- standing Las Dalias hippie market, which is home to hugely popular Namaste party on Wednesday nights. 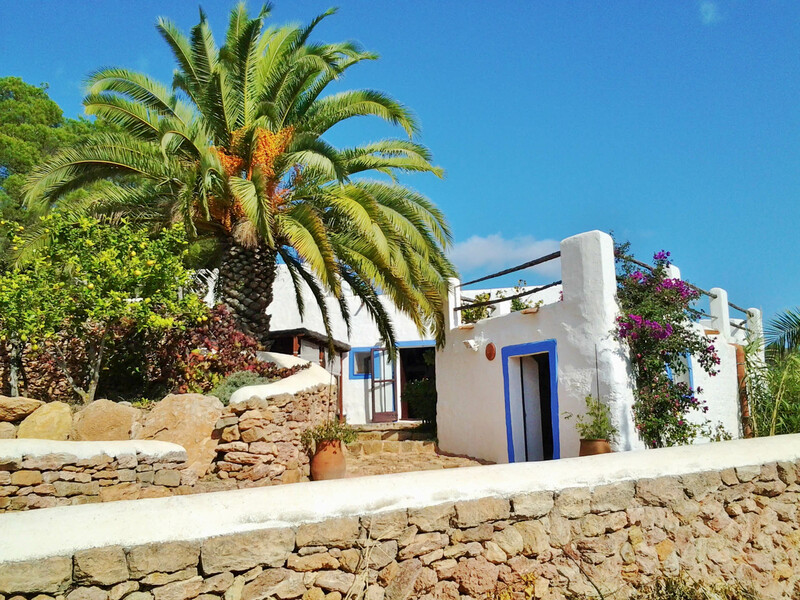 The villa is in the North-East of the island, and although for those visiting Ibiza for the first time it might not appear very “central”, bear in mind that Ibiza is actually fairy small and it takes only 30 minutes to cross the island. 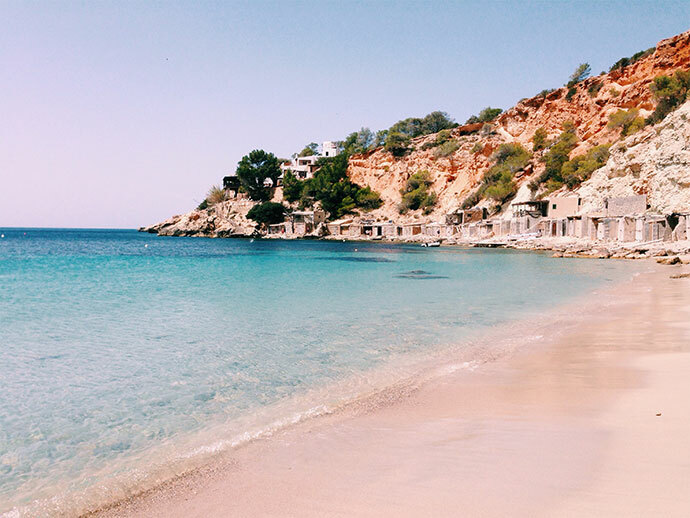 Each area of the island has its own characteristics and we recommend this area for those who want to discover a more alternative Ibiza than the one often seen in the media. This is a very international and mixed part of the island compared to for example, San Antonio, which welcomes a majority of British holidaymakers. You will find it to be a mostly residential area with not many tourists, so it is bustling even in low season. It is also offers some one of the island’s most unspoilt nature. We thoroughly recommend the use of a car regardless of where you are staying on the island as public transport services are poor and fairly limited. A short walk away are some of the islands most loved beaches, from wild, unspoilt Aguas Blancas and Cala Mastella to trendy Cala Nova – with renowned Atzaró Beach Club – and Cala Llenya, famous for its large sandy beach and turquoise waters and its lively Sunday morning second-hand market. Es Canar and Santa Eularia are also close by for those who prefer urban beaches with more facilities.